As per our wines, the spirits we import are exclusive to La Cave in the US. We pride ourselves in representing these brands as they would, choosing the right partners. Founded before the French revolution, this family owned distillery sets a new standard for Cognac with it's Microbarrique process & unique approach. You'll be most likely to find this elixir on the world's best tables but might be able to get your hands on a bottle at our partner shop in San Francisco Bitters + Bottles. "Arranging" Rum has been, for many years, a culture reserved for the Rum aficionados in France. Cedric was the very first to make it a craft. In order to deliver the best flavors, he carefully selects naturally ripened fruits. 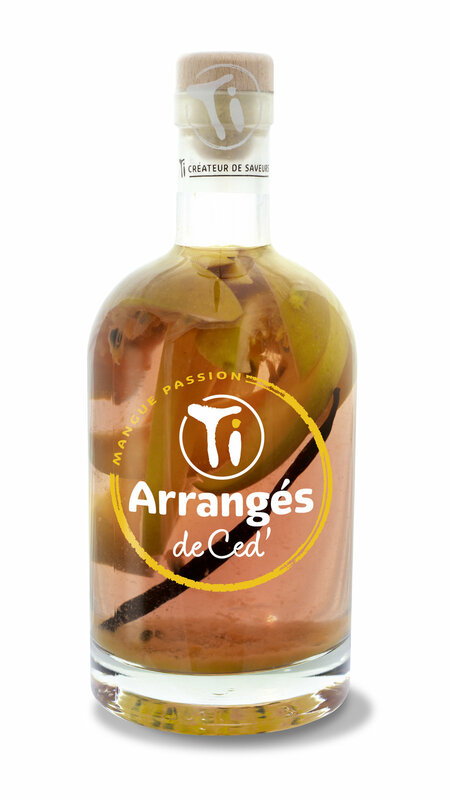 Cut manually in the purest respect of the fruit, associated with AOC Martinique rum Agricole and Bourbon vanilla from Madagascar, Cedric offers a subtle aromatic balance. Apples are grown locally in the Saint Aignan de Grandlieu hamlet. This maceration is a whisky lover's favorite, whether you want to learn or explore rhum flavors. The apple caramelizes in a Tatin way and balances the spicy & peppery side of the ginger. Composition : Rhum Agricole AOC from Martinique, Apple, Ginger, Sugar cane syrup, Bourbon Vanilla from Madagascar. 32% alc/vol. This is the only mono maceration, the Victoria Pineapple suffices to itself. It comes exclusively from the Reunion Island, where it is best grown. Composition : Rhum Agricole AOC from Martinique, Victoria Pineapple, Sugar cane syrup, Bourbon Vanilla from Madagascar. 32% alc/vol. Mingle of two fruits, one sweet and tasty, the other acidic. A maceration that pleases to the exotic fruits amateur. A standard that evokes the Antilles Islands. Composition : Rhum Agricole AOC from Martinique, Mango, Passion Fruit, Sugar cane syrup, Bourbon Vanilla from Madagascar. 32%/vol. Trade, please email info@lacavewines.com to schedule tastings.